My first comic convention of 2016 is the wonderful True Believers Comic Festival. They're having me as a guest this year which is super exciting! Here's a link to the guest list, as you can see I'm in some very, very talented company! 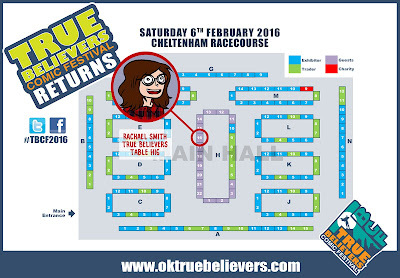 True Believers is a one day convention held on Saturday 6th February at Cheltenham Racecourse, in Gloucestershire. Visit the website for more information and ticket prices. I'll have copies of all my in-print books with me as well as badges, prints, and smiles. You'll also be able to pay by card - YAY! I'm also very excited to be on a Doctor Who Panel called 'Far More Than Just a Time Lord' with comic legends Emma Vieceli, Mike Collins, and Paul Cornell at 13:45! I'm not sure where this will be yet, but I'm sure info will be available on the day. Info about the panel is here. (scroll down a bit for mine). For a list of my other confirmed appearances for 2016, please click here.